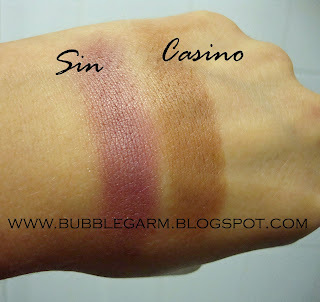 B U B B L E G A R M: Nars Sin and Casino Duo with Laguna comparison! Nars Sin and Casino Duo with Laguna comparison! Surprisingly Sin is a blusher that I didn't own. Usually I dismiss anything with a purple tone in it as not to look bruised! However, I have been informed by several people that Sin is a "must have" so I wanted "in" on this. It's a gorgeous pinkie mauve with gold reflects. It has no glitter that transfers onto the face, it just creates a matt sheen. 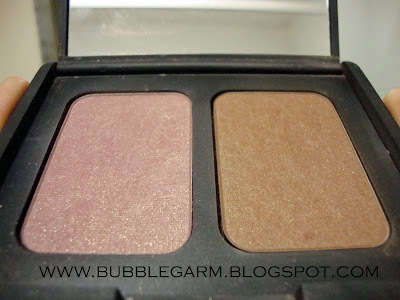 Like all Nars blushes it is highly pigmented and finely milled. This is very similar to Laguna, it's basically a darker version. I will go into detail with a comparison below. Onto the comparison, shall we? What do I think? Well, Casino is definitely darker. I only tapped my Mac 134 brush into it once for one side of the face. Usually, with Laguna I would do several swirling motions and always reapply as it doesn't really show up that much. I think Casino is the one for my skin tone... If you have fair skin I would stay away from this, however if you are olive skinned, tanned or have a deeper skin tone this will look better on you. 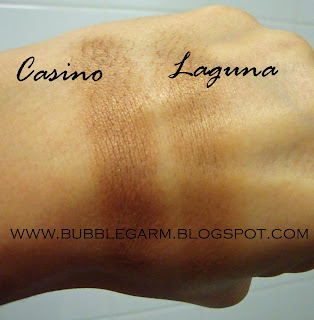 Casino and Laguna are both matt bronzers with a sheen which are finely milled, highly pigmented, have gold reflects and from the same brown family. 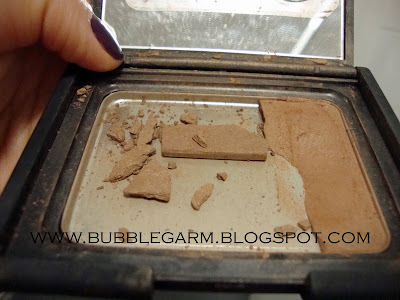 Oh and here's what my Laguna looks like now... R.I.P! Do you have Casino? If so, what do you think of it? I love my sin/casino duo! Sin is really pretty! Oh wow this is like the perfect combo for your skin. You look amazing. I have been tempted to get Casino and now I would like to try this combo on myself! Sorry for your Laguna :( Mine also crumbled in little pieces, but I used the repairing method mentioned below by Gaby, and it's still alive! Glad Casino works for you! I had this duo before but swapped it away coz it was too dark and a bit too red on me so I have to be extra careful with it. Sin is one of my fave NARS blush. It's such a sophisticate color! It look sos pretty on you!!! The whole cheek combination looks really good! Casino looks gorgeous on you, probably better than Laguna, however I don't think I could pull it off, so just hope that Laguna 's not being discontinued! I'd really love to be a part of online community where I can get feedback from other experienced people that share the same interest. If you have any recommendations, please let me know. Appreciate it!